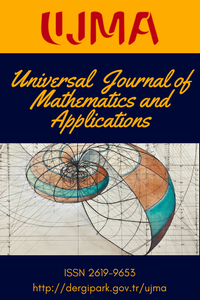 The main aim and scope of Universal Journal of Mathematics and Applications (UJMA) (Univers. J. Math. Appl.) is publishing of refereed, high-quality original research papers in all areas where mathematics plays a significant role. Universal Journal of Mathematics and Applications publishes also refereed, high-quality survey papers. The journal particularly emphasizes on research articles of common interest to a wide range of readers. Universal Journal of Mathematics and Applications has an Open Access policy: all content is freely available without charge to the users. Users are allowed to read, download, copy, distribute, print, search, or link to the full texts of the articles in this journal without asking prior permission from the publisher or the author. No submission or processing fees are required. The journal is published every three months and four issues per year (March, June, September, and December). The published articles in UJMA are licensed under a Creative Commons Attribution-NonCommercial 4.0 International License.